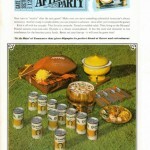 Vintage Ad Archive: Special Super Bowl Edition! Super Bowl Sunday is practically a national holiday in the U.S., a time to gather together with friends around the television, a day full of snack foods and celebratory imbibing. Major sporting events are always a good excuse to kick back and relax, and football's mix of furious action and edge-of-your-seat anticipation makes it the perfect companion to an afternoon of company and cocktails. 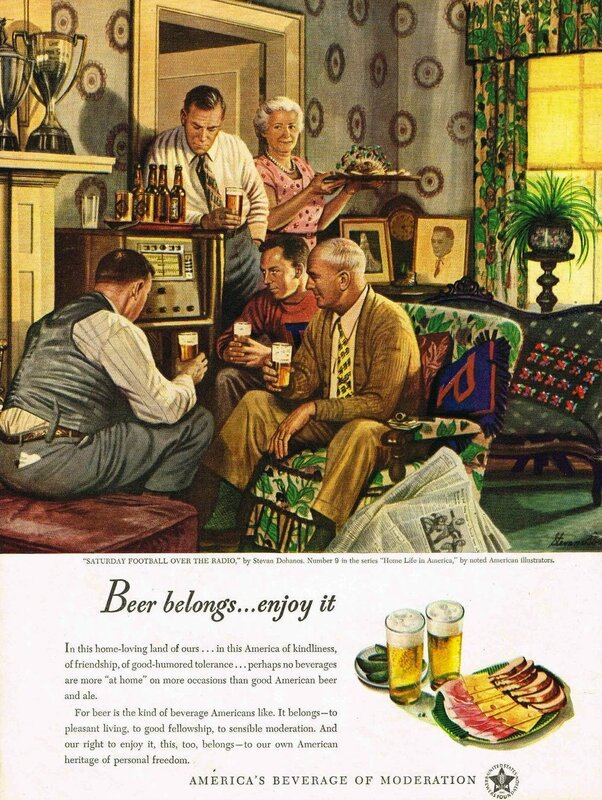 A United States Brewers Foundation ad from 1947 uses football to promote "America's Beverage Of Moderation"
So in that spirit, with the biggest day of football season upon us, it's the perfect time to take another dig through the advertising archives, and look at some of the ways companies have linked themselves to football over the years. 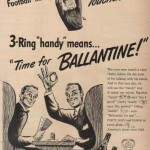 Through most of the first half of the 20th century, football was considered primarily a collegiate sport, and that perspective can be seen through much of the advertising of the era. 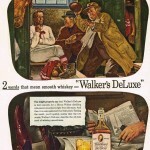 Advertisers took a variety of approaches to their football-themed campaigns: some focused on athleticism and inspiration, and some promoted the idea of game broadcasts as a time to get together with friends (and for this kind of gathering, hosts should always have the perfect beverage on hand to serve their guests). Some companies partnered with teams and printed season schedules and promotional items. 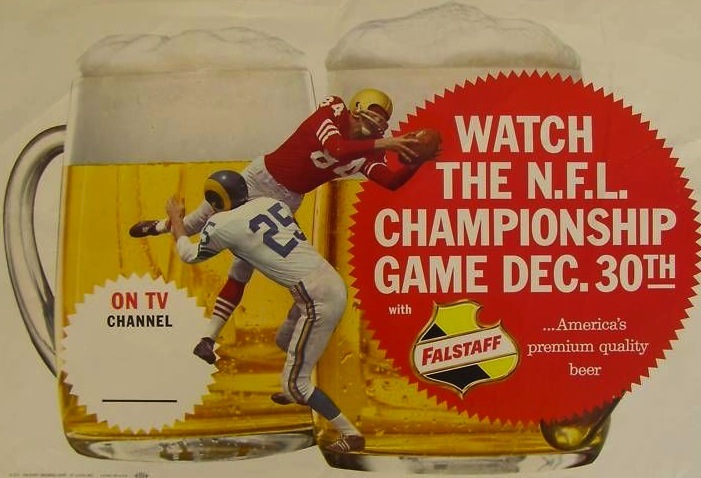 Others, in keeping with their usual approach to advertising, used football as a device for silliness and humor. 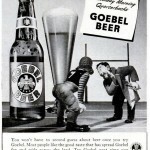 And from the mid-1940s on, as the National Football League established a stronger identity (with an on-field emphasis on the passing game, and nationwide television broadcasts becoming increasingly common), liquor companies and breweries began to focus even more on football's growing appeal. By the mid '60s, when the upstart American Football League began playing championship games with the NFL (officially gaining the title the "Super Bowl" starting in 1969), football began to challenge baseball for the position of "the national pastime". There were plenty of opportunities to capitalize, and advertisers fell over themselves in using this new American obsession to promote their brands. And some, while still charming enough, didn't bother with subtlety. 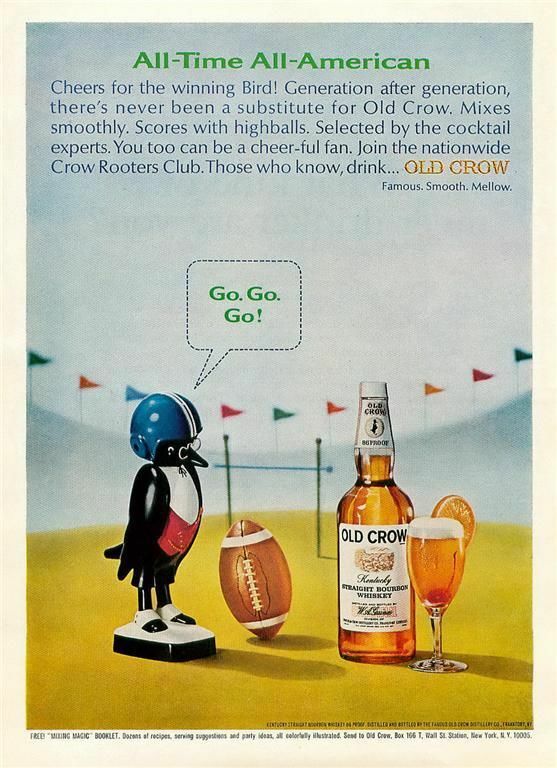 And through the latter half of the century, as the NFL became a full-fledged national obsession, companies continued to use football imagery in their campaigns, achieving a variety of different effects in the process. And it wasn't just the big names – all manner of brands dipped their toes into the gridiron and issued football-themed campaigns. 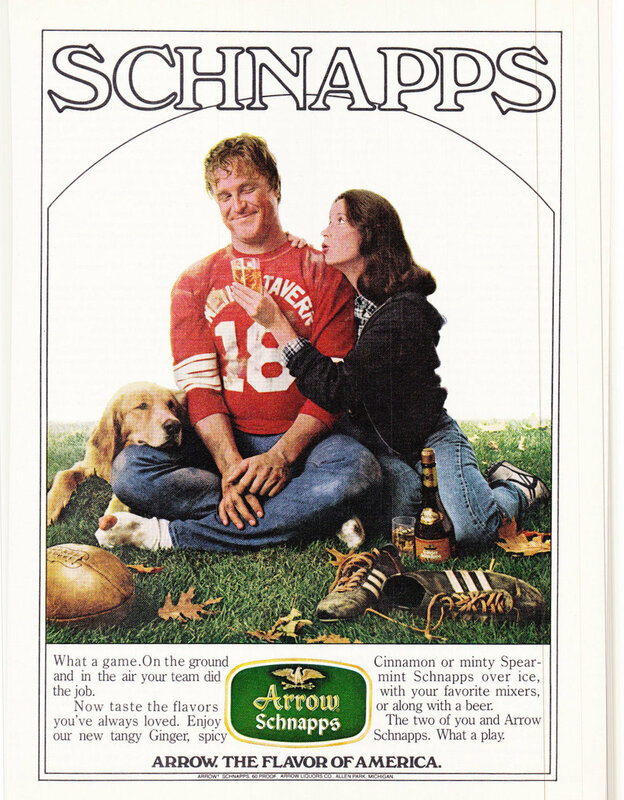 Look closely – that is, in fact, a very young John Goodman in this 1980 ad for Arrow Schnapps. And of course, as the Super Bowl has become the most-viewed TV event of the year, it was inevitable that companies would try to present themselves as the perfect companion beverage. And now that we've had this little look through history, it's time for me to get to work and perfect my own drink menu for game day – though to be honest, I might be all footballed out by that point, decide to ignore the hoopla, and simply pair a rye manhattan with a good book. Go team!